Great skincare is the foundation of any effective beauty regimen. 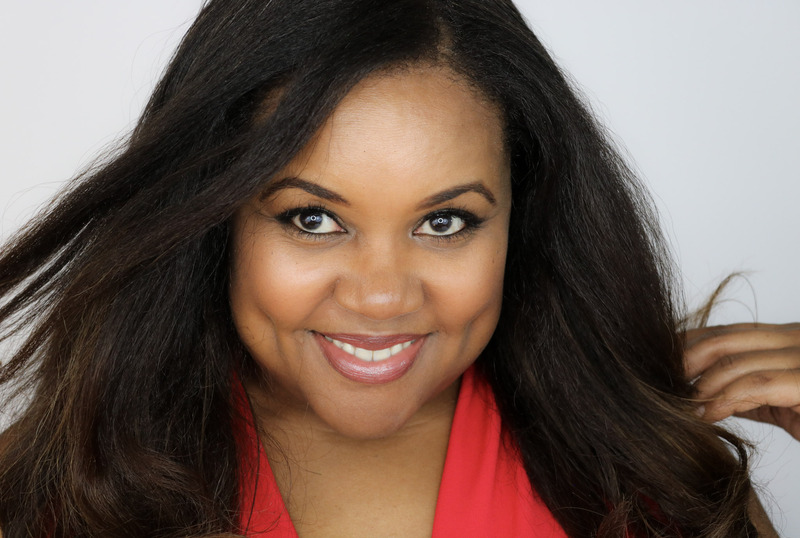 While I love experimenting and having fun with all manner of makeup, skincare is my jam and I don’t play any games. I’ve always been a fan of skincare lines created by doctors and though I have my favorites, I stay open to new discoveries. 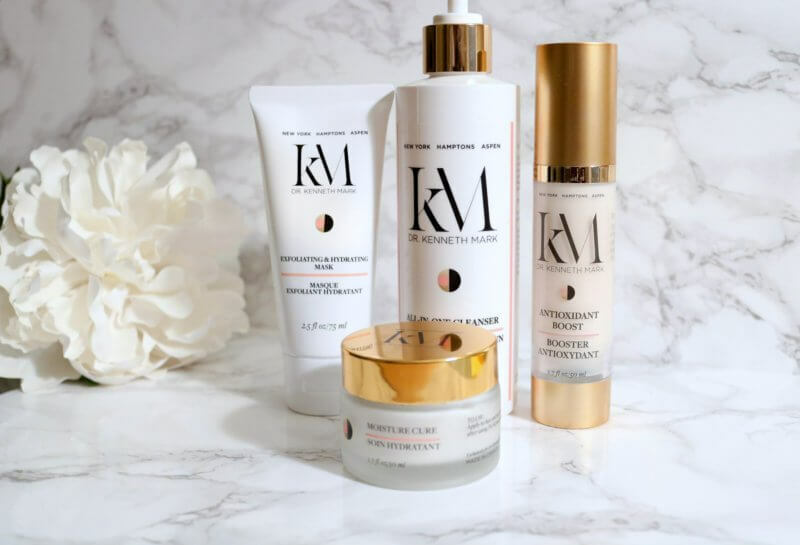 Earlier this year, I was introduced to the recently launched Dr. Kenneth Mark skincare line and I’ve been giving it a whirl for a few weeks to see how it performs. Created by skin cancer and cosmetic dermatology expert Kenneth Mark, this anti-aging skincare line employs powerhouse ingredients including stem cells, hyaluronic acid, alpha hydroxy acids and a whole host of oils, botanical extracts and Dr. Mark’s proprietary ingredient ASTA-ZOME (encapsulated astaxanthin) which is nature’s most powerful antioxidant. Focused on cell renewal, moisturization and fighting free radicals, all products in the anti-aging line are free of parabens, alcohol and mineral oil. Keep reading for my experience with each product. This luxurious cream is loaded with Argan oil, açai oil, grapeseed oil and shea butter. It also contains anti-aging peptides and antioxidants to restore hydration, sustain the skin’s hyaluronic activity, decrease discoloration and strengthen the feel of your skin. This cream is amazing. It is recommended that you apply Moisture Cure morning and night but I hardly feel that I need two applications a day. 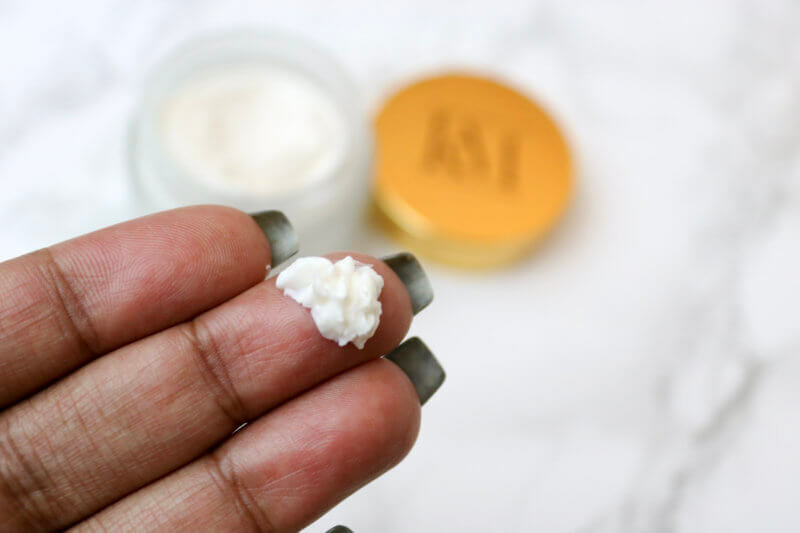 I use it during my nighttime routine and wake up to skin that still feels soft and supple. When I do apply during my morning routine, my skin feels velvety, nourished and moisturized all day. I love it! Protection from free radicals is the name of the game and this formula works to decrease the appearance of wrinkles and reinforce thin and fragile skin. It contains Dr. Mark’s proprietary ingredient, ASTA-ZOME, which contains nature’s most powerful antioxidant. 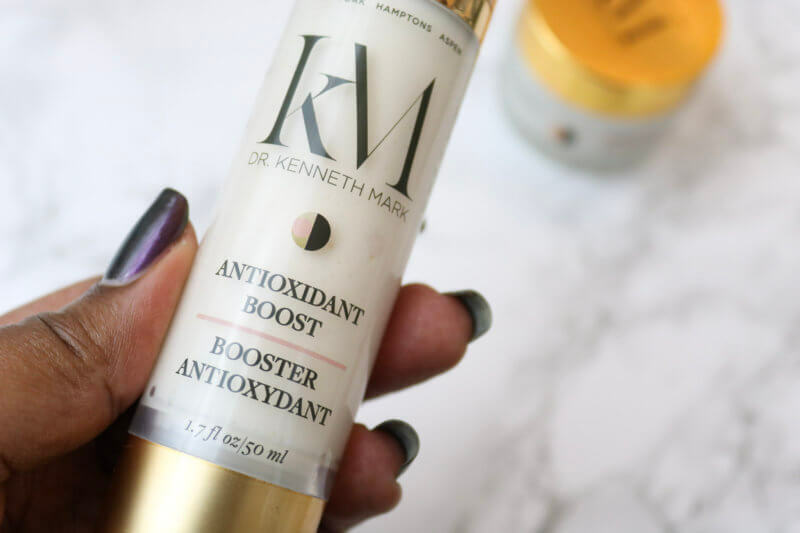 The Antioxidant Boost is also packed with stem cells, peptides, precious mineral extract, Argan, açai, olive and grapeseed oils as well as shea butter. It’s no wonder Dr. Mark calls it an anti-aging powerhouse. This is my second favorite product in the line. Meant to be applied after cleansing and before moisturizing, the Antioxidant Boost is a wonderful addition to my daily skincare routine. In addition to fighting free radicals, it is an excellent moisturizer. It absorbs quickly and contains algae extract which is a first rate hydrator. Sometimes I feel that I can forgo a moisturizer step because this product is so good. I don’t skip it of course, but I could! This soufflé-like mask contains a combination of five alpha hydroxy acids, peptides, jojoba and calendula oils and hyaluronic acid. I have a collection of favorite masks and I have added the Dr. Kenneth Mark Exfoliating and Hydrating Mask to my list. I rarely find a mask that moisturizes and exfoliates at the same time. I usually get one or the other which often leads to mask mixing. This one leaves my skin clearer, brighter and smoother without any undue scrubbing. Using it twice a week is the sweet spot for me as it keeps the dreaded dry skin around my nose at bay. The multi-tasking formula is designed to remove makeup, cleanse, tone and protect skin from pollutants with green tea extract. While the All-In-One-Cleanser does an excellent job of cleansing, it is a foaming cleanser and therefore not a good choice for me. Foaming cleansers are too harsh for my skin and always leave me feeling a little dry. After using Dr. Kenneth Mark skincare for several weeks, I am in love with most of the line. 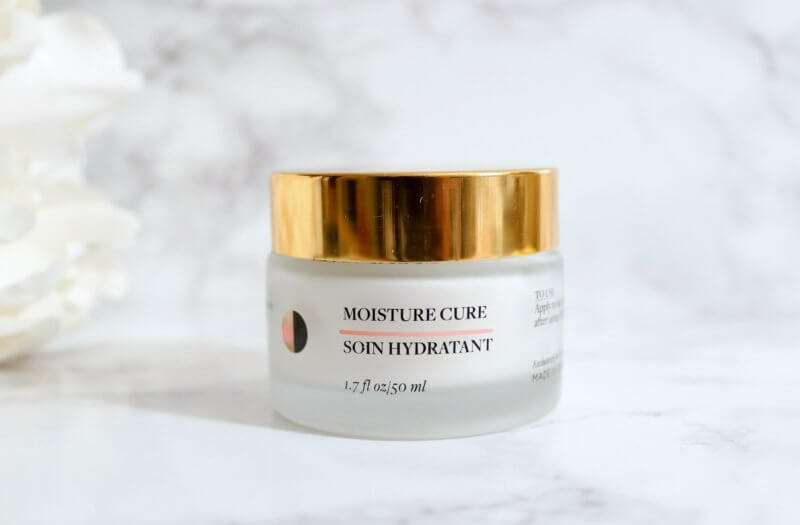 The Moisture Cure and Antioxidant Boost are my favorites and if you’re looking for anti-aging skincare loaded with proven ingredients, give this line a good look. 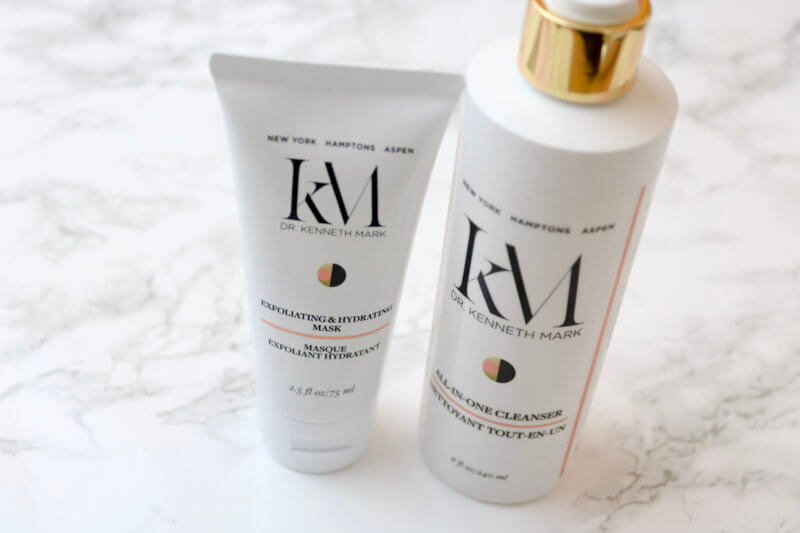 For more information and to purchase, visit Dr. Kenneth Mark Skincare. *I received these products as press samples for testing and review. Such a detailed description of the product. I wanna try the hydrating mask and all in one cleanser especially to help me deal with winter. I love learning about different cleansers, but truthfully, I find my best skin comes from washing with just plain water, and applying moisturizer. I do that sometimes but not after a makeup application. Sometimes I do water and toner and then moisturizer. You get such detailed and clean details. The post alone makes one want to purchase the items. I’ve never heard of this brand before, but it looks high quality. the packaging is nice too. It’s brand new, just launched this fall. And I love the packaging too! Are these products okay for sensitive skin? I would love to try the all-in-one cleanser. I’m looking for one that is great at removing makeup. I too have sensitive skin Kirstin, and the only thing that I avoid is the cleanser because it is a foaming cleanser and foams don’t really work for me. But, it does clean well and doesn’t leave my skin too dry. I have sensitive skin so I keep it very simple. Less is always more for me. This looks interesting. The packaging and the fact that is was created by a doctor I think will be enough to get anyone to try. Ive never heard of this skincare line. I am in the market for a good skin routine. I am glad this one works so well for you. I will have to check it out. Something to look into. I love skin care products. I have never heard of this line. Great post. I hadn’t heard of the line before but I’m definitely going to read more. Love what you shared so far!